Tapioca is a starch which is extracted from cassava root and is traditionally sold in the market either as a processed product, in form of chips, or in the raw form itself. An entrepreneur who has been dealing with starch production for many years wanted to scale up his business by processing the tapioca starch and converting it into a contemporary value added product. He came up with the idea of producing tapioca bhujia which was a novel product and a deviant from the traditional products sold in the market. Further, the bhujia was made to avail in lot of new and appetizing variants. He is looking forward for professional in branding with technical knowledge to understand the product better. Food buddies took up the challenge of introducing the innovative and unconventional product into the market. We made sure the product portrayed the goodness of the contents in the pack through a much better packaging. Labelling and branding of the product was made with great exquisiteness that made the product appeal to a good deal of consumers out in the aisles of the stores. The name “Tempty” did tempt the consumers to have a bite at it. A good product gets a better shelf if the packaging is equally good as the contents of the product. Believing in the statement, we carried out skilful work and helped to propel the sales of the product. The eye catching package design helped to fetch the targeted consumers easily. 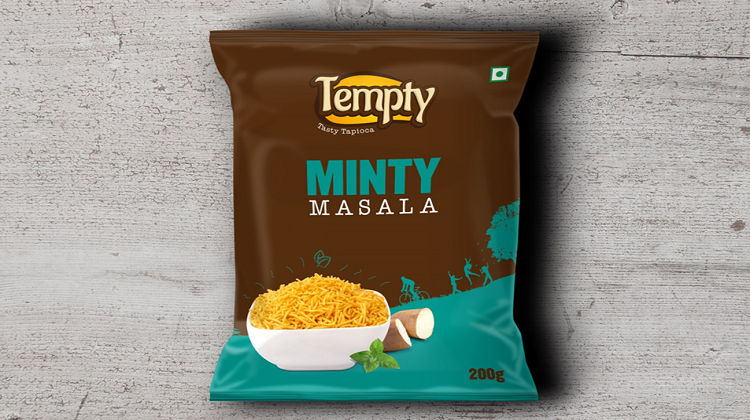 Thus, “Tempty” has become a pioneer in tapioca bhujia and has easily dethroned the competitors. Brand building and labelling does add up as an important element to the dozen and more requisites for saleability of a product. We, at Food Buddies, do it with ease and grace and the case of “Tempty” is an exemplar to the fact. The technical expertise along with the excellence branding and marketing helped us to deliver the appropriate to the targeted consumers. For Fixing One to One Consultation!